Cody Kaemmerlen in Joshua Tree National Park, CA. Photo Courtesy of Peter Quenelle. It’s an appreciation for the beauty of nature, the fragility of life, and a bold confidence within. It’s the ability to look beyond the cards you were dealt—to ignore the low hanging fruit, stand up unafraid and shake the whole tree for something different. 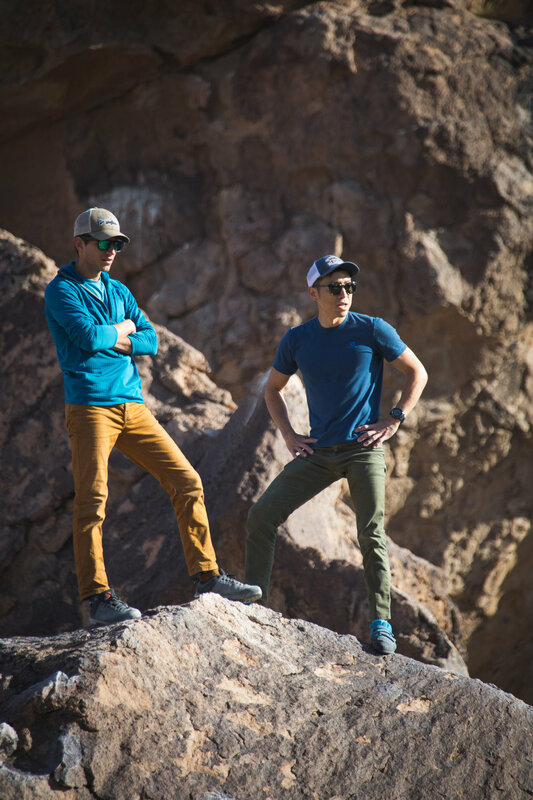 Cody Kaemmerlen is a Korean-American rock climber based in Southern California. He has a lean athletic frame and a deep baritone voice that you would think is 10 octaves too low. Cody sits across from me in a button-up shirt with meticulously parted hair and a beaming smile. As he starts to talk about the podcast he recently launched, Wilder Mind, his hands and arms move excitedly and his eyebrows rise. He is energetic and animated. I instantly recognize it as passion. Like many, he’s not paid for the long hours or the late nights and weekends he pours into this creative pursuit. Instead, his payment is the satisfaction of creating something meaningful, and the opportunity to inspire and move people even in the smallest of ways. The premise of Wilder Mind is simple: find people in the outdoors who are following a passion, and share their story to inspire others to do the same. With just four episodes under his belt, he has already built a community of people who believe that sharing their stories will create personal ripples of hope that may encourage others. Whoever said, “one person can’t make a difference” clearly hadn’t met Cody. I first met Cody while climbing in the California desert on a weekend getaway from San Diego. My climbing partners and I were walking on a path past a large group people when a guy turned around, introduced himself and started chatting with us as if he had known us for years. Yep, that was Cody. He is genuine and easily turns strangers into friends. I was also taken aback initially at the sight of another Asian American sport climber. I identify as Filipino American; I’m generally not accustomed to meeting other sport climbers who look like me. Behind the microphone, Cody, a senior management team member for a dental device manufacturer, speaks to people about their own story. At 34 years old, he also has his own story to tell. Cody grew up in small-town Tillamook, OR, a place with a population of a few thousand, marked by rolling grass fields and a cheese factory. A transracial adoptee, he was raised in a white working-class family in a mostly white neighborhood. Asian Americans make up less than 2% of the town’s population. His family spent a lot of time together in the outdoors camping, hiking, and fishing. His father was a factory worker who took odd jobs on the side. He mowed lawns, fixed houses and did whatever was required to keep the lights on. Cody’s mother was a homemaker who cared for him and his older sister. Years later, she took courses at the local community college. She went on to work for an investment firm and retired doing what she loved. Cody is unafraid to push the envelope and do unconventional things. After high school, he moved to Portland and threw himself into music. He joined a punk rock band and played music full-time, strumming his electric guitar at house parties and community events for several years. Later on, he passed up an opportunity to go on the road with his bandmates in order to shift his life in another direction. He went to school, got a degree, got married, and bought a house all within the span of a few short years. Then in 2014, on a whim, he and his partner flew to San Diego for a weekend to visit a friend and escape the Pacific Northwest winter. Somewhere in between the plane landing in San Diego and the hour-long drive to his friend’s house, they fell in love with the place. He and his partner committed the rest of their trip to driving from neighborhood to neighborhood in search of ‘For Rent’ signs. They also scoured the internet for apartments and job openings. Then they walked away from their life in Portland, leaving behind the safety net of a mortgage and two secure full-time jobs. This was the life they wanted to live. Not six months later from their initial visit, Cody and his partner packed up their bags and moved south. A new beginning for those who put ideas into action. But as I’ve learned in my own life, every day isn’t sunshine and rainbows. Even exciting opportunities come with their own set of challenges. And whatever it is, you have to push through it. Their marriage deteriorated. A divorce followed. And Cody found himself alone in a new city, facing some of the biggest internal challenges of his life. Following the split, Cody began climbing at an indoor gym for the first time and was immediately hooked. He enjoyed the physicalness of it, the mental challenge of unlocking moves on a route, and the camaraderie the climbing community fosters. He made friends at the gym with ease, and three months later, went outdoor climbing for the first time. He led his first route, despite being scared out of his mind but also “enjoying the hell out of it.” He has been climbing ever since. Photo Courtesy of Peter Quenelle. Then there’s the matter of his accident. Life has a way of keeping you on your toes and occasionally knocking you flat on your face. On Saturday, October 28, 2017, Cody fell 30 ft after a piece of granite he was holding onto broke off the wall. He was free soloing, which is a type of climbing that uses no ropes or protection; so there were no ropes to arrest his fall. He was airlifted out of the mountains and flown to the nearest hospital where he was diagnosed with a broken rib and broken left ankle. How his injuries weren’t worse, I will never know. When you go through a life-altering accident like that, you start to question a lot of things you once took for granted. Seeing his friends put their lives on pause in order to support and visit him in the hospital gave him another perspective. Cody always wanted to become a storyteller but didn’t know the best way to go about doing it. Then one-night last fall, an idea came to him. Over several glasses of wine with a friend, the concept of Wilder Mind was born. All of a sudden, there was no slowing him down. That night he didn’t sleep. From the time he got home around 2 a.m. through sunrise and into the early morning, he sketched out details on how he would make this happen. Cody emailed family and friends—and then strangers. He started reaching out to potential guests. Then the responses began to pour in. Without a single ounce of podcasting experience—he didn’t even own a microphone at the time, he secured his first guest. Often the armor of a great idea and a passionate soul is hard to puncture. He was excited and determined to bring it to life. Twenty days after the idea first popped into his head, Cody was driving up a freeway, en route to Yosemite to interview, not one, but the first two guests on his podcast: sponsored climber Jordan Cannon and climbing filmmaker, Samuel Crossley - two guys who believed in a stranger with an idea and the passion to make it happen. His words fill the room of the café. It’s clear he genuinely cares about making a difference. I believe him. Cody finds joy in connecting people. He finds purpose in sharing stories in order to inspire others and also empower people to do even greater things. It’s bold and courageous people who continue to inspire me. The friends and strangers who are determined to make their impact on the world and those who dare to be different. Let’s all be our best selves, go out and create good. There’s never been a better time than now, and you never know who may be watching.